In large bowl, mix cookie mix, softened butter, cream cheese and egg with spoon until soft dough forms. Spread dough evenly in bottom of pan; sprinkle sugar over top. Bake 19 to 23 minutes or until light golden brown. Using end of wooden spoon, immediately make 40 (1/2-inch) indentations in baked bar (8 rows by 5 rows) without going through to bottom of pan. Clean off end of wooden spoon with paper towel as needed. Fill each opening with 1/4 teaspoon jam. Cool completely, about 1 hour. Cut bars into 8 rows by 5 rows so jam is in center of each piece. Remove bars from pan. Store covered in airtight container in single layer. 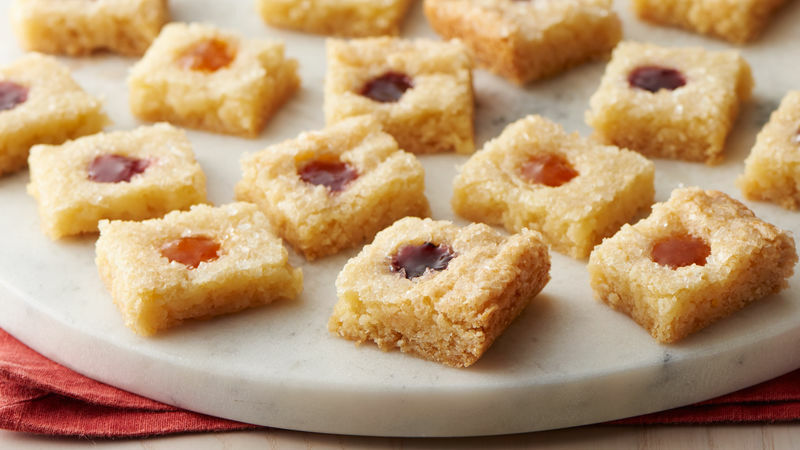 This cookie bar is based on the popular Thumbprint Cookie, which were often called Thimble Cookies in older cookbooks because bakers used a thimble to make the indentation. Coarse sparkling sugar adds extra sparkle to holiday cookies and can be found in the cake decorating section at most grocery stores. Cutting the bars while still warm will give a more polished look.